Our sweet, July, baby girl just turned one and it was a One In A Melon girl's 1st birthday party bash! 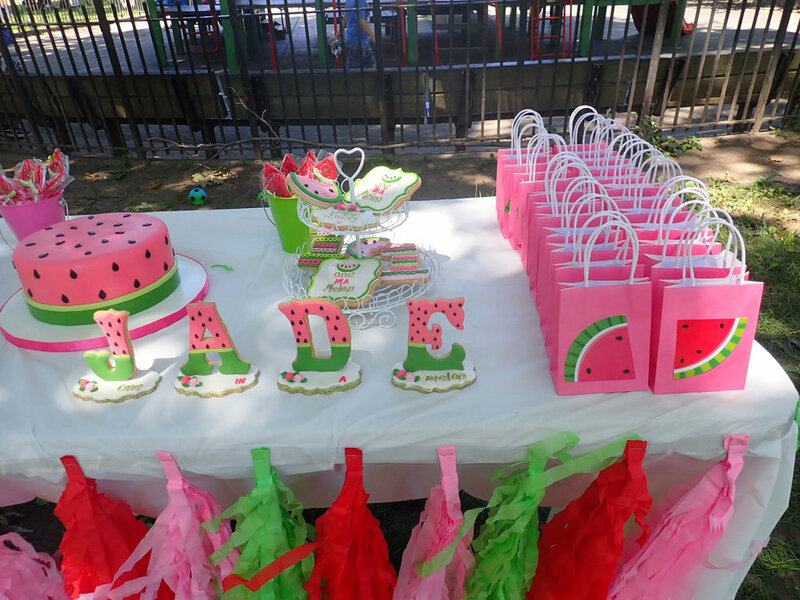 In the park + bright and colorful + and as unique as our Jade Avery... what's not to love about this super adorable watermelon birthday party theme! The invitations will be your guests first peek into what to expect, so we went with this sweet invitation from Etsy. Her watermelon first birthday outfit was honestly the cutest thing ever! We all know Etsy is the best when it comes to personalized goodies so the adorable onesie from TinyLovesCo was a no brainer. For the tutu, though, I decided to go the DIY route. Not just because they were ridiculously expensive but also because finding out later on that I actually made it, will hopefully make it a little more special for her. As soon as I was all Pinterest-inspired, I knew Sara's Cakes would get my exact vision. Our mouth-watering watermelon cake and standing Jade cookies created the perfect star attraction. Right after our main girl of course! These personalized cookies, also by Sara's Cakes, and the juicy watermelon lollipops were the final touch for the sweets. And the pink and green buckets were a steal for under a dollar each and beyond perfect for this melon party. It's her first birthday but it's the second celebration where we have celebrated her life, so I thought it'd be cute to incorporate a hint of Jade Avery's baby shower theme. To do this, we subtly added flowers to the party decoration and finished it off with the same floral "Love, Jade Avery" mint tins as her baby shower. The goodie bags I also knew I wanted to make myself. I found these mini bright pink kraft bags and these watermelon cutouts, and voila! My own adorable DIY One In A Melon goodie bags, perfect for a summer birthday or any summer party. Oh, my sweet little Jade, you really are One In A Melon! You may also enjoy: Cars, Planes and Trains Birthday Party! and What Will Your Child Grow Up to Be?